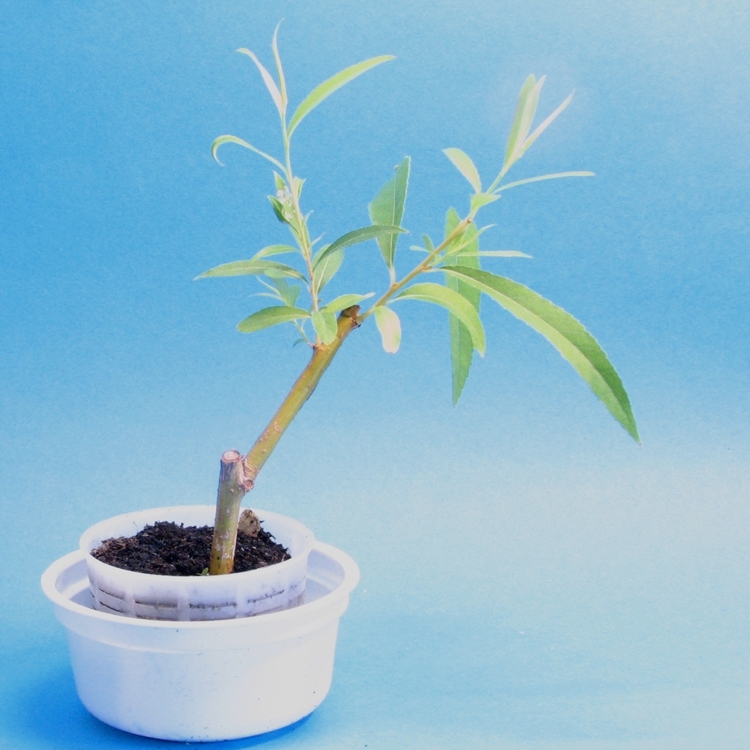 Last November, I cut a twig from a willow tree near my house, put it into water and waited for the roots to grow. 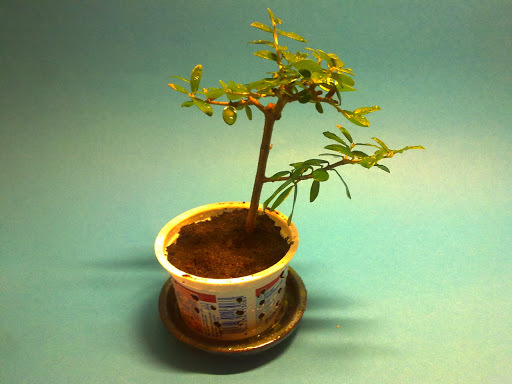 They did after a while and so I planted it and from time to time cut it to make it into a nice bonsai. I wouldn’t call it a proper bonsai tree yet, but I like how it has turned out so far. This is the only tree I haven’t grown from seeds. After being so successful with my attempts to grow lemon and pomegranate from seeds, I had grown a bit impatient about my olive seeds (and many of the others, but that’s a different matter). I have also watched some videos about germinating seeds and one was about olives. 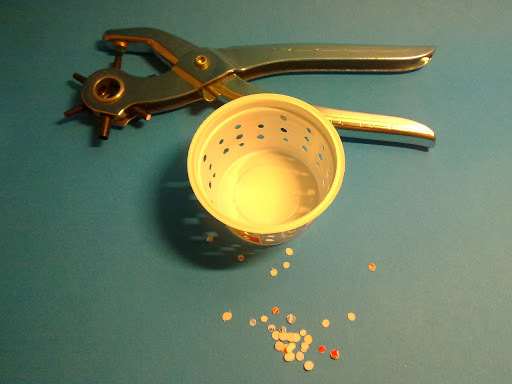 The guy in the video suggested to crack the seeds for better chances of germination. A happy coincidence has it that I had just bought a nutcracker today (for different purposes – but that story is for another day). If you have read more of my blog, you might know that I had brought olive seeds from my trip through Turkey – three from Gümüşlük (or Gumusluk) and three from the Asclepeion in Pergamon/ Bergama. So, I turned the pots over and tried to find each tree seeds in the soil. I cleaned them under running water and carefully cracked them open. The tree from Bergama seemed fine, but two of the ones from Gumusluk had disintegrated. The photograph shows the three olive seeds from Bergama. 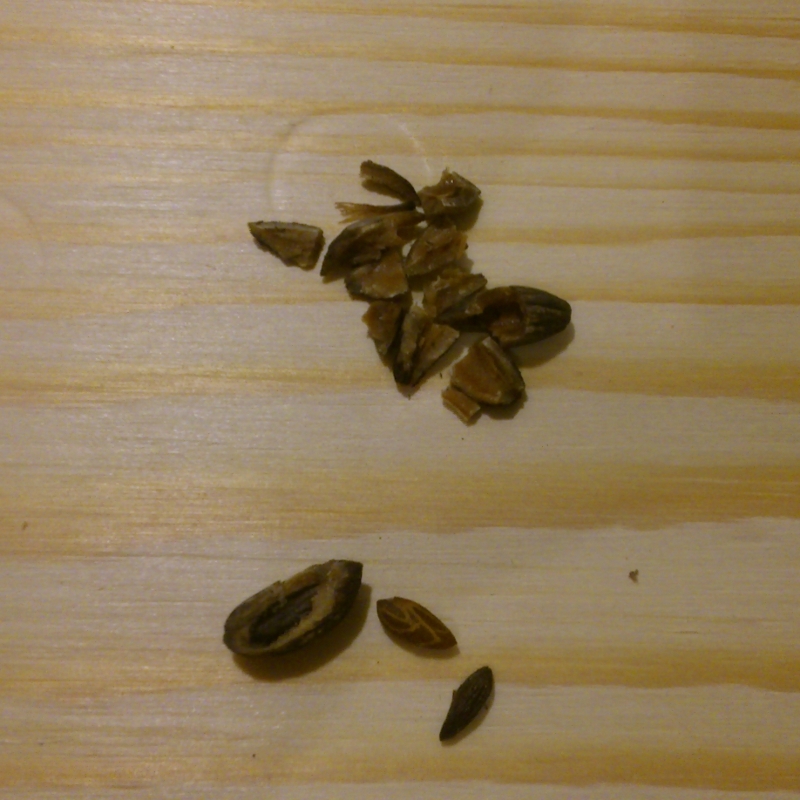 You can see that one seed is still half covered by the shell, but I didn’t dare cracking it more for fear of hurting the seed. Anyway, if it germinates, the root will need less effort to get out. Last Saturday, I had bought that lovely little olive tree in the gardening store. It has a very thin trunk which I want to grow stronger, so I needed a net pot planter. But there aren’t any in this size (5 to 7 cm diameter). So I thought that I could make one myself. 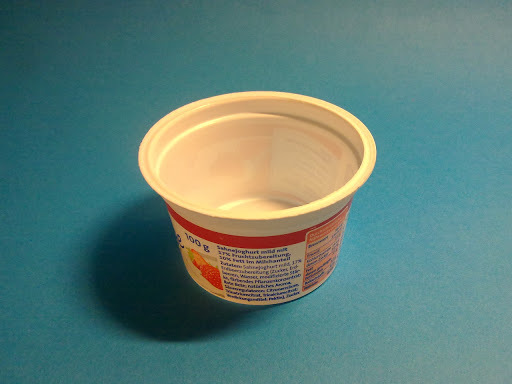 Luckily; I discovered an empty yoghurt cup on my co-worker’s desk, so I asked her not to dump it and give it to me instead. She was also so kind to clean it for me. And then I repotted the little fella into it. I do hope it has enough holes. Today, I decided to try a garden store my co-worker recommended, because she said that they had bonsai trees and could also consult on Bonsai. They sure had some trees and I got a little olive tree for 7,99 €. 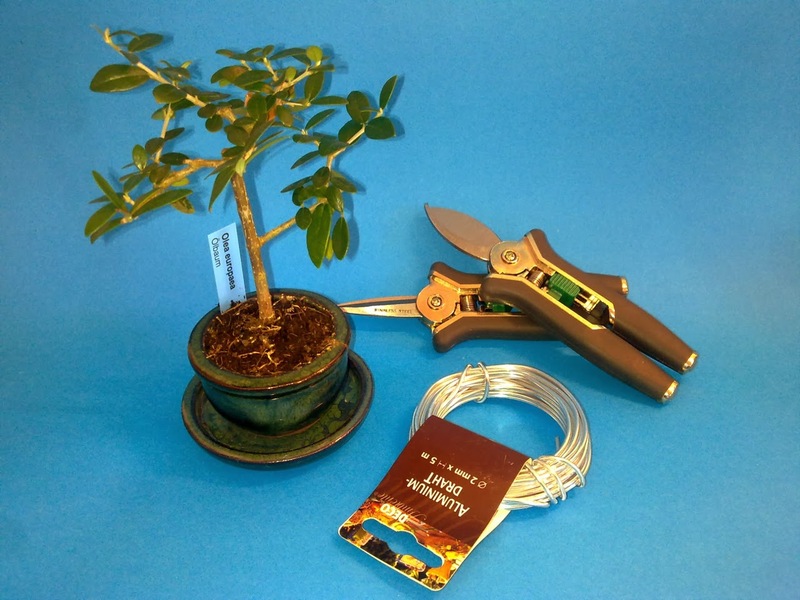 They also had some scissors for Bonsai, but they looked shabby. So I got common garden scissors instead. I also bought some aluminium wire, not from the Bonsai department, but from the handicrafts department. 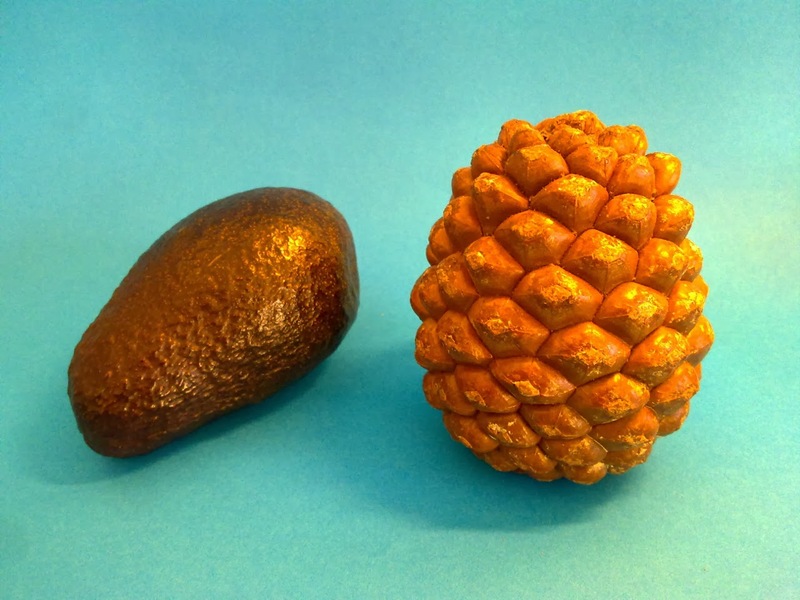 Then I needed to do some grocery shopping anyway and luckily, they had avocados (not that unusual) and pine cones (very unusual, but maybe due to the season). As I mentioned in my wishlist, I wanted a Hass avocado anyway. I forgot to check where it came from, but I guess Israel again. The pine cone, however, is from Turkey.